In Foolproof Magic, I discuss techniques to help us avoid basic misplays, the kind that can ruin the games of beginners and pros alike. Here we see Pro Tour Champion Ari Lax keeping his finger on his Eidolon of the Great Revel to help himself remember the damage trigger. I introduced a similar tip in Foolproof Magic #4. Throughout the series, I’ve addressed the most embarrassingly simple mistakes and how to prevent them. Today, we’ll discuss the most advanced issue yet. The most common error in Magic is not having a game plan. That’s what we can hear pros say on podcasts like Limited Resources and MTG Pro Tutor. Without a cohesive strategy, a player is vulnerable to misunderstanding the importance of cards and to playing the wrong one at the wrong time. Bad sequencing of land drops can spell doom. Last week, I lost a game and match for just that reason. The Modern tournament had run late into the evening, and only six minutes remained on the clock. I was focusing on playing quickly, and it cost me. Predatory Sliver was my first play of the game, and I had already thrown it away. Playing Mutavault as my second land prevented me from executing the correct game plan, which was to cast Frenetic Sliver on turn three. The disruption to my curve prevented my presenting two threats on the following turn, and the loss of tempo ruined me. After the game, I wished I’d spent ten seconds to organize my thoughts. Holding the entire progression of the game in my head would’ve been difficult for me in my frazzled state. I would’ve needed some visual framework to help me craft a game plan. It would’ve taken a tactic I’d practiced ahead of time and learned as a discipline. I needed a Foolproof Tip. Here, I’ve ordered my opening hand from left to right in the progression I plan to play my cards. I decided I wanted the Mutavault, Sliver Hive, and Cavern of Souls in play as my first lands, so I could potentially attack with the land on turn four as well as play the Predatory Sliver. This initial strategy will change, as the next card drawn will be the third Predatory Sliver, but this time, I’ll be ready to use it to its fullest potential. By looking at my cards in a new way, I’ve taken my game to the next level. For practice, let’s look at potential opening hand for the Esper Dragons Standard deck by Akio Chiba that Top 8’d Grand Prix Kobe. It’s just a collection of cards—until we form a plan. Let’s say we want to be able to cast Silumgar's Scorn on turn two and draw the max cards off Painful Truths turn three. How would we sequence our hand? In this example, we will need to restructure our hand and game plan after drawing multiple cards off Painful Truths. Of course, we would also be changing things as our opponent makes plays and we gain more information. Speaking of information, our opponent might see us arranging our cards. For a long time, I resisted techniques like this out of fear I’d bleed intel to my opponent. Well, that concern is another thing pros say the average player shouldn’t worry about. We gain more from creating concrete plans. First, the opponent is likely to not understand our method. Second, if we arrange a newly drawn card to the front of our hand, it could be a land or a spell. Third, if the opponent has seen our hand (through a Thoughtseize), we can still shuffle and then rearrange. Sometimes, despite our best efforts, we still lose. It’s easy to feel crushed after such games and to blame bad luck. Focusing instead on what we can learn will help us stay positive and grow into better players. I wrote an article on stoicism and anti-tilt technology that addresses this issue, but here, let’s take a Foolproof approach. After a loss, as our opponent walks away with the results slip, let’s take our life pad showing our defeat and flip it over. On the back, make two columns. The first will detail all our woeful misfortune. The second will list the mistakes we made during the match as well as potential deck-building errors. If we can’t think of anything to put in the right-hand column, that’s probably another mistake. It is rare to play a perfect match, and we’re better off assuming we could’ve done something else, such as a mulligan or a change in game plan. Notice in the second paper to the right that I’m also keeping track of how cards are performing in my deck. Each game, I consider which card I’d rather have drawn. After the tournament, I’ll take all these records home to my deck notes. I do this for science!—and to see trends that’ll increase my understanding as to how to improve. A loss can feel especially crushing if we were locked out of the game by hate cards. One of the most dastardly would be Blood Moon, a card I dread in Modern but love to play in Legacy. I am all too happy to remember that Blood Moon is reddening my opponent’s lands and blazing away all his or her non-perfect colors, but I sometimes forget it also applies to mine. This can lead to play mistakes that would be hard to forgive. With Magus of the Moon on the battlefield, my three lands of Mountain, Mountain, City of Traitors could no longer cast Avaricious Dragon. 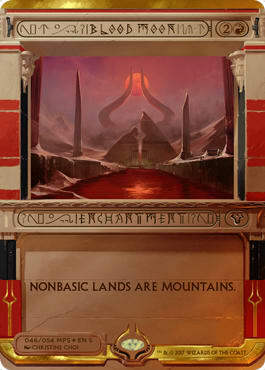 Here, I’ve placed a red counter on my nonbasic land. Some judges would prefer you place the counter near the land, not on it, but as long as you’re clear what the counter indicates, there shouldn’t be a problem. The next and final tip is also judge-approved. From Legacy to Standard, cards with delve require we keep track of our graveyard. We want to know exactly how many cards are in our ’yards without being too obvious about it. I want to be able to see how many cards are in my graveyard using my peripheral vision. Looking directly at the discard pile will give away too much to my opponent. To that end, we can create a visual pattern by arranging the cards in our graveyard in a distinct way. The first three cards I order in a visible, but typical fashion. The fourth card I place at askance. The fifth and critical final card is at a ninety-degree angle. My graveyard is now ripe. I can cast Become Immense for the single mana. If I were tracking toward Dig Through Time, I’d place the sixth card tilted to the lower left, and so on. That’s all for this Foolproof Magic. For tips about remembering if you’ve played a land, see Foolproof Magic #4. To avoid information bleed and confusion over mass combat, find Foolproof Magic #3. For designing systems to manage complex board states, go to Foolproof Magic #2. And to remember triggers, read the first in the series.